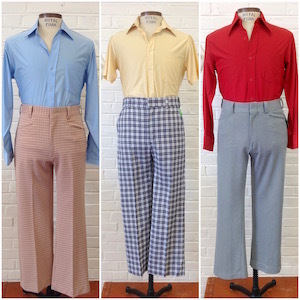 Home > Men's Vintage Shirts > Men's Vintage Shirts: 1970s > FUN 1970s disco outfit Shirt & Pants. Sizes S-XL. (disco on a budget!) Custom picked for you! We will put together a FUN 1970s outfit for you- perfect for a party or costume! We have been doing this for over 10 years and we know how to put together a funky disco look! The shirt will be polyester with a big butterfly collar, and either a solid colour or with a small pattern. The pants will almost always be polyester and wide leg/flared (NOT huge bell bottoms- those cost more than this whole outfit) and will match/go with a colour of the shirt. The pants inseam will be at least 29". Long inseams are tough to find; you are welcome to tell us your actual inseam, but we make no promises other than at least 29". 1970s suit jackets are an additional $45 and will be either 2 button (classic) or 4 button (leisure), and will match the outfit. 1) Please MEASURE YOURSELF before you choose your sizes above. 2) You can add preferred colours or a note, but I can't promise we will have your exact colour scheme on hand. 3) Your outfit will be shipped within 3 days. XL shirts and pants are an additional $5 each. 2XL is NOT available thru this deal but we try to stock them on the website. If you need larger than 40" waist pants- please contact us before you purchase. You MUST measure yourself. Modern and vintage sizes are not the same. If you go by your "modern" size, chances are the 70s clothing we pick for you will be too small. We are currently sold out of specific sizes. If the sizes we currently offer will not fit your measurements, please do not order! These outfits are final sale and if it doesn't fit, you cannot return it. All sales are final. By placing the order you are agreeing that you know this is a final sale and you cannot return the outfit. The photos below are EXAMPLES! You will get your own custom outfit- not one of the outfits you see here.